Uma Mahadevan completed a medical degree at the State University of New York in Brooklyn. She completed a residency in internal medicine at Mount Sinai Medical Center in New York, a fellowship in gastroenterology at the University of California, San Francisco (UCSF) and a fellowship in inflammatory bowel disease (IBD) at the Mayo Clinic in Rochester, Minnesota. Dr. Mahadevan currently serves as Professor of Medicine at UCSF and Co-Medical Director of the UCSF Center for Colitis and Crohn’s Disease. Certified by the American Board of Internal Medicine as a Diplomate in internal medicine and gastroenterology, Dr. Mahadevan is a member of the American College of Gastroenterology and the American Gastroenterological Association, for whom she is a Councilor for the Clinical Immunology, Microbiology and Inflammatory Bowel Disease (IMIBD) Section. 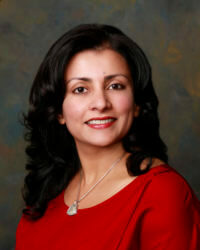 She served as President of the Northern California Society of Clinical Gastroenterology in 2005 and was formerly Chairman of the National Patient Education Committee for the Crohn’s and Colitis Foundation of America, as well as Director of Patient Education for WE CARE, an organization of women professionals in IBD. Dr. Mahadevan has authored several book chapters relating to IBD, and she has published original articles, abstracts, editorials, and invited reviews in such peer-reviewed journals as Gastroenterology, American Journal of Gastroenterology, Inflammatory Bowel Diseases, and Gut. Additionally, Dr. Mahadevan is an editorial board member and reviewer for several journals. Dr. Mahadevan specializes in the treatment of ulcerative colitis, Crohn’s disease, and pouchitis. She has a particular interest in pregnancy and fertility in IBD, as well as in clinical trials of experimental therapy for both ulcerative colitis and Crohn’s disease. Her current projects include a national prospective registry of pregnancy outcomes and drug safety in women with IBD on immunosuppressive and biologic medications, clinical trials in biologic therapy for IBD, and microbiome, environmental and dietary changes among South Asians with IBD.